To be honest, I don't understand why people are more interested in Finn and Poe than in Finn and Rose. Sure, Finn and Rose are meant to be the cute beta couple (as opposed to the angsty alpha couple with Rey and Ben/Kylo), but they are still way more interesting than Finn and Poe who are just... cute? I guess? Like, heck, even Rian said it himself: he created Rose precisely because Finn and Poe going to Canto Bight was boring, lol. @Gemlake wrote: I read through quite a few of the responses to the official Star Wars' tweet asking for fans' favorite ships, and not a single person mentioned Finn Rose. Finn Poe, yes. Judging from the message boards, Star Wars' fans seem completely uninterested in this pairing. Which is odd, in a way, because they had an entire plot line devoted to them, and the actors did a terrific job with the material. Two seconds of Poe and Rey seems to be generating much more interest. Ignoring the alt right reactions to the Finn Rose pairing, I wonder if part of the problem is Rian. This board may disagree, but I don't think he creates engaging characters in the way that JJ/Kasdan did. For all the complaints about TFA, I think we're here because we care about Kylo and Rey. Add to that Poe, Finn, Hux, BB-8, Maz, Phasma. In contrast, I think Rian's best new characters were the Porgs. Rose is cute, but I'm not invested in her character. I thought her sister's few seconds of screentime were more intriguing than anything she did. The realistic truth when it comes to relationship debates in the modern SW fandom is that everything comes down to Reylo. Two seconds of Poe and Rey is only generating more interest in online debate circles than canon FinnRose because it gets in the way of Reylo. ¯\_(ツ)_/¯ It gives desperate losers in the "anything but Reylo club" something, anything to wield as a weapon. I know from two years of personal experience that FinnRey fans supported FinnRey primarily for the same reasons. They fought so hard for a couple with no narrative potential exactly because Reylo was so threatening. They spent two years using FinnRey as a reason for why Reylo "so totally wasn't happening" rather than creating, loving their pairing and putting good things out there (see: fighting what they hate, not supporting what they love). The truth of the matter is they felt nothing for Finn and Rey romantically (duh because it just wasn't in the movie), and the same can be said for crack Damerey today. It was and still is about stopping Reylo. FinnRose, in contrast with anything that gets in the way of Reylo, evokes no conflict or debate. It's simple. It's canon and definitely endgame. Not only does it not get in the way of Reylo, it complements it fully. Pretty much all Reylos support FinnRose, but there's no point putting a lot of thought into it. We'll cheer for them until the very end as the perfect canoninal ship-mate to the ST's central dynamic, but the SW fandom as a whole just has no reason to discuss or debate FinnRose. There's not much to talk about besides "they're cute" and they "work well together," or if you're in the other camp, "they're boring." There's also nothing for FinnRose supporters to prove at this point because she ship has already sailed. Popular ships are born from controversy. Naturally a lack of controversy, a lack of "this stops Reylo," and a pretty well endgame romantic connection with nothing to prove = a lack of interest. Just as an aside, I can't really say I agree at all about Rian's characters. Holdo resonated with me tremendously, which was something I didn't expect at all going in. Paige's one scene was so damn effective it quickly became one of my favorite parts in the movie. Rose's character exudes such a wonderful feeling. She's just a feel-good sweetheart for me all around, and while her and Finn's storyline obviously isn't the most engaging part of the movie, I still like it a lot and look forward to seeing the Fathier break and that shot of her and Finn riding in front of the moon with the music soaring every time. I'm excited to see how J.J. develops Finn and Rose's relationship in IX. You won't see anybody hotly debating (or heck, even thinking deeply) about FinnRose for the same reason Pride and Prejudice is not called Endearing and Shy and doesn't focus on Mr. Bingley and Jane's uncomplicated, cute love story. That doesn't mean Lizzie and Darcy fans don't support or enjoy Bingley and Jane's relationship in the context of the story, it just means we aren't going give up our analysis of Lizzie and Darcy's much more layered romance to prop up the simple, endgame Bingley and Jane. FinnRose are a classic example of a narrative "ship mate" or "beta" couple. You encounter them frequently in, well, romantic dramas and comedies. They're always uncomplicated, sweet and based much more around comic relief. That, and they tend to serve the purpose of providing extra drama for the "alpha" couple down the road, the Rey/Kylo's and Lizzie/Darcy's. In Pride and Prejudice Darcy single-handedly helps Jane and Bingley (and in doing so proves himself to Lizzie). With that thought in mind don't be surprised if/when Ben does something huge to help Finn (and by proxy, Rose) at some point in IX. The ST also seems to be taking the reigns as the most romance-driven Star Wars saga, ironic considering David Kamp's "NO CENTRAL ROMANCE" misquote from Vanity Fairy last spring. As much as the prequel trilogy surrounded a story about the consequences of loving somebody the wrong way the sequel trilogy is probably going to conclude with two successful romantic couplings in Rey and Ben and Finn and Rose. It'll bring the sagas full-circle by resolving a narrative about the healing power of loving somebody the right way, the selfless way, the Rey/Ben and Finn/Rose way. As for Finn/Poe it appeals to a very specific internet demographic. They're more interested in supporting a gay couple -- any gay couple -- than they are a heterosexual couple like Finn and Rose. But the fact remains Stormpilot is a crack ship. As much as I would have loved to see it developed in the canon it wasn't. That chapter is now closed. FinnRose and Reylo are both "go", as evidenced by TFA and TLJ. I do think that Rose/Finn interactions kinda miss the same spark that JJ brought to Finn/Poe and Finn/Rey in TFA. JJ is insanely great at portraying charming dynamics and squeezing every last drop of charisma from his actors. Rian I think was going for the same lighthearted screwball type of feel, but he's just not as good at it IMO. 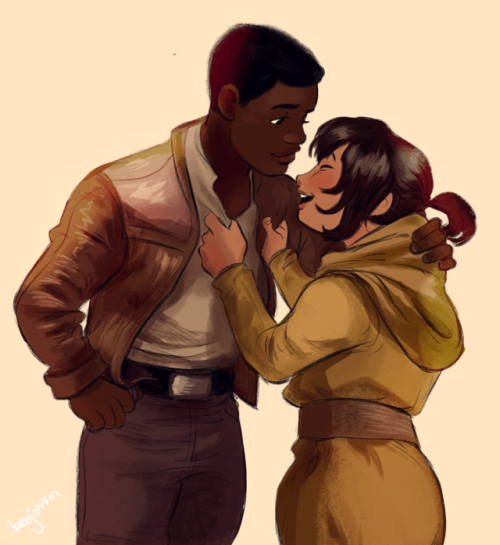 @Saracene wrote: I do think that Rose/Finn interactions kinda miss the same spark that JJ brought to Finn/Poe and Finn/Rey in TFA. JJ is insanely great at portraying charming dynamics and squeezing every last drop of charisma from his actors. Rian I think was going for the same lighthearted screwball type of feel, but he's just not as good at it IMO. I agree. I just don't buy the "beta couple" excuse for the lack of interest in Finn and Rose. This is Star Wars. The most mundane topics get endless discussion. If fans were interested in the relationship, you would see plenty of evidence for that on youtube and message boards. The discussions would include things like: what are Finn's feelings towards Rose? How will Rose feel about Finn and Rey's close friendship? What is the meaning of the final Finn Rose scene? Where does their relationship go in Episode IX? Will they get another kiss? etc. I don't know, I can't not think the fact that FinnRose doesn't get in the way of Reylo has something to do with the lack of interest in it overall. Not from casual fans, but from the obsessive corners that speculate as much as us? Yeah. People love to argue and hate so of course the negativity is going to be louder. There are corners that will attach to anything and everything that revolves around Reylo not being endgame, and I mean anything. About a year ago I witnessed a few real posts surrounding Rey and Luke as a potential romantic coupling for the ST. I will say I'm curious to see what JJ does with Finn and Rose. Finn and Rose work very well for me personally. I don't really think Rian was going for a screwball dynamic with them at all. He wasn't just trying to recreate Finn and Rey but rather do something new and different. As for other dynamics, I've never found Poe and Finn appealing. I find some of their scenes in TFA rather jarring and over the top. Finn and Rey. Meh. I never watch TFA and think "oh yeah I can't wait to see Finn and Rey make friends." Rey's chemistry and connection with BB-8 is far more touching to me. Now that was a dynamic that J.J. brought to life perfectly. Daisy quite simply blew her first few scenes alone and with BB-8 out of the water. The parts of TFA I find least interesting are all between the escape from Jakku and Takodana. The only negative I can really come up with as far as FinnRose goes is that we guessed their entire arc. Nothing really came as a surprise to me other than the kiss (which I adore because 1) it was a welcome surprise, 2) the scene is really moving, and 3) it solidifies FinnRose in a way nobody can deny). I will say that Rose/Kelly completely outshines Finn/John in this movie, something I kind of think Rian expected to happen. I think Rose is contrasted beautifully with Finn in that regard. While he's unsure of what he wants, she knows exactly. She's the nobody to his "hero," but really she's the one who proves herself to be a hero in the end, and not just a hero but his hero. I love Rose's spirit and confidence (contrasted with Finn's doubt). She's wise beyond her years in a way that I find very endearing. I love her little moment with the fathier. I love how she hands her most valued possession over in a heartbeat for the cause. I love her smile and how much delight she takes in the prison escape (contrasted with Finn who tells her to stop enjoying it lol). The journey is really hers in this movie. Finn kind of feels like dead weight just tagging along sometimes, but then I felt that way about him in TFA too. I honestly can't even blame Rian for this. Finn has always had characterization issues. I still like him, but he's always been a little disappointing. He never was the defected stormtrooper character I wanted and I accepted a long time ago that he never would be. There is already quite a bit of beautiful FinnRose art out there. Sleemo and Basila-bae post people's creations daily. In general, I do think people like Rose herself more than FinnRose, which I get. They're still liked though, just not in the same way as Reylo. I think they're seen as kind of a given. They don't generate controversy or rile people up on either side of the spectrum. They're not a clickbait couple. @MyOnlyHope wrote: Finn and Rose work very well for me personally. I don't really think Rian was going for a screwball dynamic with them at all. He wasn't just trying to recreate Finn and Rey but rather do something new and different. As for other dynamics, I've never found Poe and Finn appealing. I find some of their scenes in TFA rather jarring and over the top. Finn and Rey. Meh. I never watch TFA and think "oh yeah I can't wait to see Finn and Rey make friends." Rey's chemistry and connection with BB-8 is far more touching to me. Now that was a dynamic that J.J. brought to life perfectly. Daisy quite simply blew her first few scenes alone and with BB-8 out of the water. The parts of TFA I find least interesting are all between the escape from Jakku and Takodana. The only negative I can really come up with as far as FinnRose goes is that we guessed their entire arc. Nothing really came as a surprise to me other than the kiss (which I adore because 1) it was a welcome surprise, 2) the scene is really moving, and 3) it solidifies FinnRose in a way nobody can deny). I will say that Rose/Kelly completely outshines Finn/John in this movie, something I think was kind of intentional. IMO she contrasts beautifully with him. While he's unsure of what he wants, she knows exactly. She's the nobody to his "hero," but really she's the one who proves herself to be a hero in the end, and not just a hero but his hero. I love Rose's spirit and confidence (contrasted with Finn's doubt). She's wise beyond her years in a way that I find very endearing. I love her little moment with the fathier. I love how she hands her most valued possession over in a heartbeat for the cause. I love her smile and how much delight she takes in the prison escape (contrasted with Finn who tells her to stop enjoying it lol). The journey is really hers in this movie. Finn kind of feels like dead weight just tagging along sometimes, but then I felt that way about him in TFA too. I honestly can't even blame Rian for this. Finn has always had characterization issues. I still like him, but he's always been a little disappointing. He never was the defected stormtrooper character I wanted and I accepted a long time ago that he never would be. Wow, it feels like you articulated so many of my thoughts about Rose, Finn, Rey and BB8, but more eloquently; especially the bolded portions. I also found Rose quite endearing. I remember reading a review that called her a true woman of the people and I agree. I don’t understand the anger towards her in some corners of the fandom. Based on what I’ve seen and heard, I really think it’s mostly shipping salt from Finnreys and Stormpilot fans. I agree about Finn. I think his character has had some serious characterization problems since TFA. I’m not blaming John for them, but Finn has felt like a sidekick since TFA and his personality is nothing like a ST. While I found his friendship with Rey cute, it was not something that enamored me to TFA to the point that I want another movie with them joined at the hip on another insta-BFF adventure. Especially after TLJ made it clear Finn is not part of the Force plot. I’m curious what JJ is going to do, whether he’s going to put Rey and Finn together like he did in TFA or if he’s going to do something else. I actually hope he doesn’t do the full on Rey and Finn duo and pigeon hole Finn into the Force plot. I can’t really see how that would work and it would undeniably cement Finn into the sidekick role. I also found Rey’s connection with BB8 absolutely precious and I was sad they were separated in TLJ. That whole opening scene of Rey on Jakku, then meeting BB8 was the best part of TFA, along with Rey and Kylo’s interactions. Sadly so much of the Rose hate is coming from salty StormPilot shippers in particular. Unlike FinnRey, that ship has quite the army. Remember when TFA came out and the most talked about romantic relationship instantly became Finn and Poe? FinnRey hardly got any support at all until Reylo started to rise. I can understand the frustration from StormPilots, but in all fairness they had fair warning ages ago that their ship wasn't happening. Complain about the missed opportunity all you want, but don't go after Rose ffs. I'm interested to see how Finn and Rey are handled in IX as well. They'll probably be split up at some point (Finn just isn't a part of Rey's story just as she isn't a part of his). The one thing I can see them maybe trying to help each other figure out are the "new," "confusing" feelings they might have for Rose and Kylo respectively. I'm undecided how J.J. going to handle Finn finding out about Rey's connection to Kylo (if they go the route of having it revealed somehow). I think it's more likely Poe is the one who will be angry. If anybody in the Resistance would hear Rey out, I think it would be Finn (maybe Rose if J.J. feels like developing that relationship, and I will say I'm crossing my fingers for that). Finn is not an ex-Stormtrooper. He's an ex-janitor, and I'm not trying to insult the character. I really like Finn and like you made peace with his innumerable characterization flaws a long time ago. The fact is TFA and TLJ proved that the majority of his value to the Resistance lies in his knowledge of the layout of the First Order bases he used to mop. He's an endless wellspring of First Order blueprints. If it were any other fandom I would agree, but SW fandom has been rather ship unfriendly. Reylo and stormpilot really shook the old timers after TFA ( kylux took a while to get going and by then shipping discussion had been mainly shut out, besides which it is slash which almost never gets talked about in fanboy spaces) to the point that a lot of the reylo backlash was likely due to the influx of "silly fangirls" in their super serious movie. Add in that FinnRey lived from reylo spite for the most part, I am not really surprised FinnRose isn't being talked about much. No ships get talked about much tbh, except maybe to drag anidala. Imo none of the other Star Wars ships are as inspired or hold as much magic, potential and drama as Reylo. Just thinking more about Finn/Rose, I think one of the reasons Canto Bight consistently gets a meh response is because Finn is so passive and inert during the whole section. Rose drives pretty much all of their actions while Finn just sorta tags along; she shares her life story, gives a speech on why she hates the place, gets the idea of releasing the farthiers, talks to the stables kids, sets the last farthier free etc. She could honestly just have gone to Canto Bight by herself with BB-8 and they would have accomplished the same result without Finn. I understand that they aimed for Finn to learn from Rose, but what's really fun to watch is the characters working together like say Finn and Poe do at the beginning of TFA when they're trying to escape. And then in the end when Finn tries to act on his own, he is still railroaded by Rose who serves him up yet another lesson. Not necessarily saying that Finn should have died, but it just felt like more of the same from the Finn/Rose dynamic where she's there to teach him stuff. And from the male/female dynamic point of view, I suspect that this lack of assertiveness from Finn is a complete turn-off to be honest. He's so much more passive around Rose than he's ever been around Rey. I think Rian wanted to present Rose and Finn as equals unlike Rey and Finn. I mean, around Rey, Finn can't even tell the difference between a Harris wrench and a roll of tape and don't even get me started on that FoD episode where Finn doesn't even recognize a tracker when he sees one. Meanwhile, Finn and Rose are talking together about hyperspace trackers and even finishing each others sentences and working as a real team. I think the only thing was that Rian wanted to portray Rose as the wise, experienced one in the relationship and Canto Bight was her moment to shine. 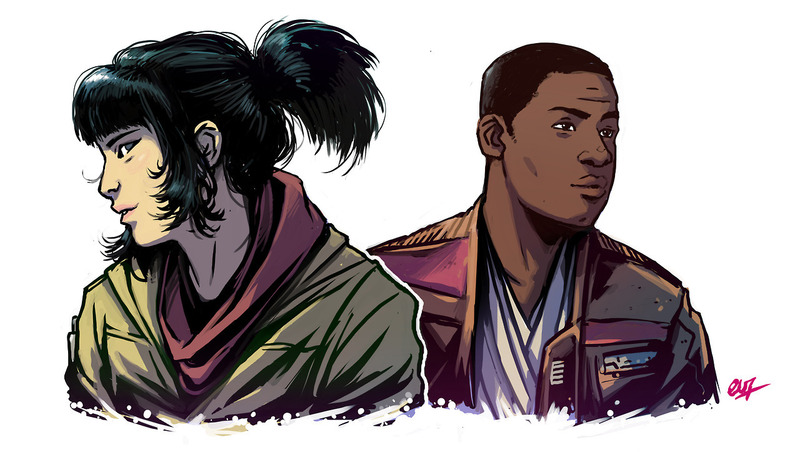 I feel like in the end, both Poe and Rose kind of detracted from Finn's character. @Irina de France wrote: To be honest, I don't understand why people are more interested in Finn and Poe than in Finn and Rose. Sure, Finn and Rose are meant to be the cute beta couple (as opposed to the angsty alpha couple with Rey and Ben/Kylo), but they are still way more interesting than Finn and Poe who are just... cute? I guess? Like, heck, even Rian said it himself: he created Rose precisely because Finn and Poe going to Canto Bight was boring, lol. Thank you @Irina de France for post this .... I had a lot of thoughts reading this. Sorry. Unfortunately I don’t speak English very well. I love this forum because many topics are writed without malice. You are cultured. Get ready. Open. I need you. My poor English can change what I mean. I hope to don’t offend anyone. I use google translator to translate and something may come differently from how I think. Thank you all for being here. Because the fact that you too have many questions, makes me feel less alone. Too many haters are on the street. I believe that every soul must have its time to grow. Empty hatred is only the first step of a long ladder of life. So, I think the audience wants a couple Finn-Poe because the moment is mature to welcome a gay couple inside Star Wars. The authors dared a lot with this story. Kylo Ren is a true romantic hero. A boy divided between good and evil. He could be a terrorist who understands his actions and repents before carrying out an attack. He could be a boy who gives in wrong friendships. A child abused as a boy who becomes bad. A boy left alone by parents who are too busy. Yet I think, Kilo Ren is really the hope. (The haters can't understand this!). The protagonist is Rey, because she tells through her eyes, how love can change everything … also when everything is lost. And since love, in my opinion, is always love. Gay too wants to be part of this love. I think it's time to say this is true. Love is always love. We all need love. But I don’t think there will be a place for gay love in this story. Finn is already with Rose. But Finn is the good guy in this story. He is Rey's faithful friend. Always choose the good. He sacrifices itself. He is not excessive. He is balanced. I think it will be Finn who understands Rey at the end and tell her “ go to Ben, You love him”. I also believe he will be a great friend of Poe and eventually one of this two will save the other. Because LOVE is always Love. In my opinion there was room for a gay love in this story. Maybe they did not have the courage. In this story they dared so much with Reylo. How they showed the fragility of a bad hero. Generally the bad hero is just bad. Here he is a sensitive, fragile, losing villain. This is great strength of this story. A hero who crosses himself and his fears. A child who becomes a man. I've never seen such a beautiful masterpiece. I hope that directors and authors are not afraid of the mediocrity of the people. And I dare to save this boy and give him a happy life. And wanting to simplify happiness is to love and be re-loved. In other, I see also too much Hope in this story. We are all Ben Solo, None of us is Rey. Every day we choose between good and evil. It is called free will. Of course we are not at war like Star Wars. Many People are killed in war. But in life we can kill others continuously. With words. An evil that we repent. A low blow that escapes from hand. A continuous balance between good and evil. This is what we really are. I believe this Star Wars. He captured me for this. It is simply wonderful. And if you want to make sense of this story. There can only be Ben's redemption. And I think redemption happens when love prevails. The public is not ready. How we are not ready to accept others. The different people, different principles, different religions. Everything scares us. We hate everything different because we are human. But at the end only love for the other could save us. This is the meaning of history. Love saves everyone. For this, according to me. If they want to make a masterpiece. Rey's love must save Ben/ Kylo. Kylo Ren (not Ben) must save Rey. After … for me, they have to live together, because if one die or both dies, the love is again unbalanced. Possibly, yes. Although the reverse may also be true. A fair amount of the interest in Finn Rose seems to come from Reylos. Like the art mentioned above. Maybe because Finn Rose perfectly complements Reylo. And, like Reylo, it's a relationship that is based on the realities of the movie, not the fans' imaginations. And for those of us heavily invested in the trilogy, it's a nice diversion from the more complex romance. I will say that even though I don't find Rose a compelling character, I'm happy to hear that others here do. Your arguments for her are persuasive. @Mana wrote: I think Rian wanted to present Rose and Finn as equals unlike Rey and Finn. I mean, around Rey, Finn can't even tell the difference between a Harris wrench and a roll of tape and don't even get me started on that FoD episode where Finn doesn't even recognize a tracker when he sees one. I completely agree. Finn's passivity and indecision probably makes people uncomfortable on a subconscious level. There's a reason nobody was mentioning Finn at all when initial review tweets for the movie started coming out. Rose was getting a ton of much deserved critical love right from the beginning while Finn was kind of overlooked and forgotten. You can tell from watching the movie that Rose is Rian's baby, not Finn. He's never seemed all that inspired by the character to be honest (you can see/hear/almostread the giddiness in his voice and how his eyes light up when he talks about Kylo, Reylo and the interrogation scene). I can't really blame Rian for being unconsciously less interested in carrying on Finn's story. Like ha, same, Rian. J.J. didn't give him all that much to work with, and this is coming from somebody who still enjoys the character. I also agree that no other SW couple holds even a fraction of the magic or narrative weight that Reylo does. Personally, I don't put thought into the others without also looking for connections or insight into Rey and Kylo. For example, I appreciate the poetry of Anidala and Hanleia when contrasted with Reylo, but I've never thought about them much on their own. I certainly wouldn't have cared to seek out a community of people to discuss either pair if I'd been around during the OT or PT days. To me, FinnRose earns an easy 4th place after Reylo, Anidala and Hanleia (note that I'm undecided on 2nd and 3rd place. I appreciate Han and Leia's spark, but Anakin and Padme definitely carry their story more consistently across three films. There's just more there to think analytically/symbolically about). Reylo has both aspects x 1,000,000. I've heard Kanan and Hera from Rebels are also developed quite well, but I haven't seen enough of Rebels to confirm or deny for myself (will fix that sometime this year). @Saracene wrote: Just thinking more about Finn/Rose, I think one of the reasons Canto Bight consistently gets a meh response is because Finn is so passive and inert during the whole section. Rose drives pretty much all of their actions while Finn just sorta tags along; she shares her life story, gives a speech on why she hates the place, gets the idea of releasing the farthiers, talks to the stables kids, sets the last farthier free etc. She could honestly just have gone to Canto Bight by herself with BB-8 and they would have accomplished the same result without Finn. I understand that they aimed for Finn to learn from Rose, but what's really fun to watch is the characters working together like say Finn and Poe do at the beginning of TFA when they're trying to escape. When you put it this way it's obvious that Rian played his hand at the subversion of romantic gender dynamics the Reylo relationship is so famous for. Rose actually is a pretty dominant female character, more so than Rey, who largely emerges from her interactions with Kylo "on top" because he's just so enamoured with her. By contrast there's a touch of a Tsundere in Rose, a term used to describe a (usually female) character who goes between hot and cold when in the presence of the male character they like romantically. She'll probably "cutely" attack the guy or call him names, just like Rose does to Finn. Rey also came across as a little dominant in her friendship with Finn, but the majority of fans actually didn't interpret any romantic interest from Rey, which would have coloured the dynamic very differently. Rose on the other hand knows she has a crush on Finn and acts on it. Unlike Rey who constantly kept things from everyone but Kylo (reluctantly in TFA, intentionally in TLJ), Rose isn't afraid to tell Finn how she feels. This gives Finn and Rose's bond more emotional weight from my perspective. It doesn't weaken them, it makes them stronger. I'm positive Finn's passivity around Rose made some see Finn the way they saw Kylo in TFA for getting wrecked so many times by Rey. So yeah, subconscious insecurity is probably to blame for a lot of the Rose-related "hate" out there. I can understand not seeing the character as compelling, but the vitriol I've seen goes waaaaaay beyond that in some... ahem... corners. Of course, these corners also skew Finn/Rey and Poe/Rey... both as debunked as the Rey Solo and Rey Skywalker they skewed for two years. Good observations, and yeah, I'm with you about Finn/Poe appealing to a very specific internet-related demographic, i.e. fans who want any gay relationship in Star Wars. The majority of the ship hate does seem to be coming from that crowd, unfortunate as that may be, because different ships attract fans for different reasons. When you put it this way it's obvious that Rian played his hand at the subversion of romantic gender dynamics the Reylo relationship is so famous for. Rose actually is a pretty dominant female character, more so than Rey, who is largely largely emerges from her interactions with Kylo "on top" because he's just so enamoured with her. By contrast there's a touch of a Tsundere in Rose, a term used to describe a (usually female) character who goes between hot and cold when in the presence of the male character they like romantically. She'll probably "cutely" attack the guy or call him names, just like Rose does to Finn. Rey also came across as a little dominant and the Finn and Rey friendship, but the majority of fans actually didn't interpret any romantic interest from Rey, which would have coloured the dynamic very differently. Rose on the other hand knows she has a crush on Finn and acts on it. Unlike Rey who constantly kept things from everyone but Kylo (reluctantly in TFA, intentionally in TLJ), Rose isn't afraid to tell Finn how she feels. 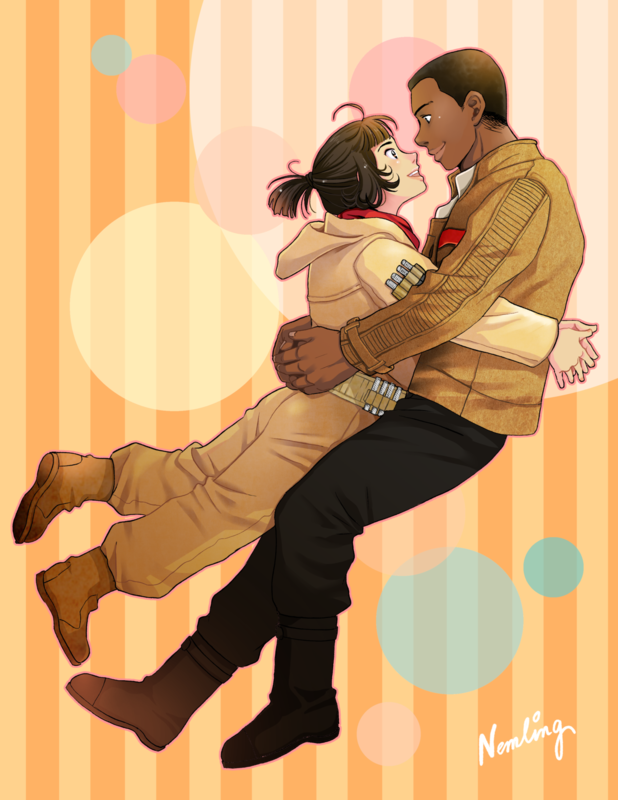 This gives Finn and Rose's bond more emotional weight from my perspective. It doesn't weaken them, it makes them stronger. This is a really important point IMO. I don't think some realize just how much of an anomaly Reylo really is as a popular "ship". I'm not all that knowledgeable about shipping culture, but I do know that the vast majority of ships with a heavy internet following are crack ships like Hermione and Malfoy or crack slash ships Harry and Malfoy, Finn and Poe, Dean and Castiel and Sasuke and Naruto. Most popular ships in general aren't canon in the least bit (just have a look at the pairs on Tumblr's weekly popular ship list). For a lot of people, shipping is about fantasy I think, about taking ownership over stories in a particular way. The majority of canon ships don't get even close to the same kind of support as crack ones. Again, Reylo is a monumental exception. Seasoned shippers typically just scoff at canon couples and continue to do their own thing. Something like FinnRose is never going to generate the same interest or support. It's just the way of things. And IMO people's attraction to Reylo isn't really about shipping at all, not in the traditional sense. We're attracted to it because we're meant to be. It's not just a fictional "ship" like Finn and Poe. It's the central dynamic of the ST and it's intentional for us to be drawn to it (see: Star Wars twitter's infamous ship tweet). It being such a crucial and engaging part of a narrative is what draws many of us in, not he "idea" of two characters looking good together (which is what "shipping" is usually all about). Finn-Rose exists because Rose is a consolation prize so that Disney can point to a progressive, multicultural couple when Reylo happens and Finn doesn't get the heroine. And since they have to have the couple, they have to find something for them to do. No matter how much it gives the movie a giant dead spot. I don't particularly like Finn, but I felt bad for the people who do. Because they're right. He doesn't get anything worthwhile in The Last Jedi. @Kylo Men wrote: Finn-Rose exists because Rose is a consolation prize so that Disney can point to a progressive, multicultural couple when Reylo happens and Finn doesn't get the heroine. And since they have to have the couple, they have to find something for them to do. No matter how much it gives the movie a giant dead spot. I don't particularly like Finn, but I felt bad for the people who do. Because they're right. He doesn't get anything worthwhile in The Last Jedi. I can't say Finn was ever designed as a character to "get" Rey. There were talks about a central romance when only two characters existed, Jedi Killer and Kira. I'm fine with having a contrast couple. Lots of romantic dramas and comedies have them and I personally really like Rose as a character. I'm just in the boat with many others here in thinking she outshines Finn in pretty much every way. Rian just wasn't overly inspired by Finn and again, can anybody really blame him? The best thing he can do at this point is organize that Trooper rebellion.